Personally, I am puzzled by this attitude. I love SAS programming too! But that doesn’t stop me from using EG. 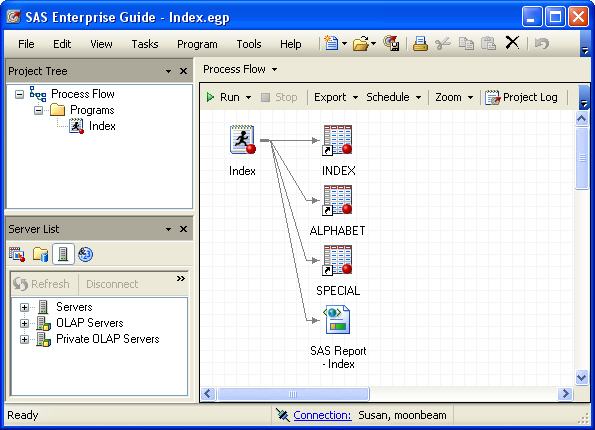 In fact, I really like writing SAS programs in EG. Here’s an example of why. Lora Delwiche and I just turned in the final draft of The Little SAS Book for Enterprise Guide 4.2–but we’re not done! Now it’s time for us to create the index. As far as I know the only SAS Press authors who have ever done their own indexing are Lora, me, and Jay Jaffe. You have to be a little crazy to create your own index. But we’re also smart, so we wrote a SAS program to create our index. Indexes are more complicated than most people would think. It’s not exactly text mining, more like text manufacturing. When we wrote the last edition of this book three years ago, we created an EG project named Index.egp. So now, instead of rummaging around trying to figure out how we created the index last time, all I had to do was open the project and everything was there including a pretty little process flow diagram. That’s why I like programming in EG, because three years later it’s so much easier to figure out what I did before.